Miles today: ~15 miles ish. Deflate air mattress. Put away sleeping bag. Roll sleeping bag. Eat breakfast. Toss all bags out of the tent. Roll tent away. Pack backpack. This is my morning routine. It’s simple and gets me out the door fast. We started hiking by 630am. We had a 10 mile hike to River Ranch resort, where we were supposed to spend 2 nights to rest our tired feet. 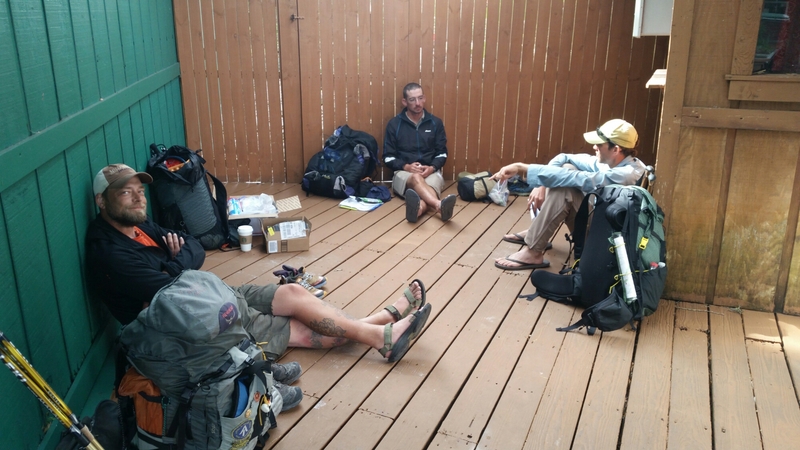 Once we arrived there at 930am, we were hoping they would have good resupply option and food. We went to the front desk and asked about the maildrop I had sent myself. It showed I had 2 package… 2?! What was the second one? 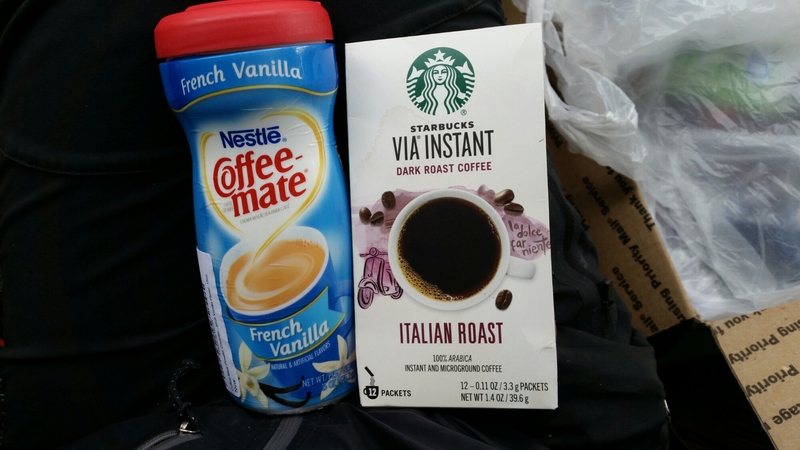 Upon opening it, I saw French vanilla creamer and Starbucks via coffee. I thought Bryan had sent me a care package but after talking to him, he informed me a friend of ours had sent me the package. Which was super sweet! Now I can see in my tent and enjoy a warm brew on the cold Florida mornings. Thanks again Shawn!!! We asked about their daily rates, over $200 a night for a hotel room with 2 beds. We looked at each other and decided to think about it. We walked to the general store and got some food. A piece of brownie was over $5. Small block of cheese was $8… You can see that the boys were going to pay a pretty penny to resupply food for the next few days. The selection was limited. Donuts and mac and cheese was basically it. I chatted with the cashier and she offered us biscuits and gravy. We excitedly accepted the offer. We sat outside the store on the side as to not disturb their business… We do look and smell homeless afterall. After 5 hours, FrontPage had found that in the guidebook there was a fish camp down the road, 5 miles to be exact. We all agreed to push on to pay only $85/night for 3 twin beds and a rollaway bed. We all had our separate beds! The cabins are cute and have everything we would need. Their office has very limited snacks items to resupply but well priced. We talked to a worker and she offered to take us to a convenient store 15 miles out. We were happy to get the ride. Like I said, this place is pretty awesome. We’re all showered now and tired from another long day of hiking. I hiked about 5 miles with a pizza in my hand. My arms and hands are tired! But yay, I got pizza for days! I did laundry in a bucket and soap. You should of seen the color of the water… Made the swamp looks clean. Wait, the swamp was actually crystal clear! For this trail, I purchased altra running shoes. I heard great things about them and they have been fabulous… Until mile 100. The fabric started to rip off inside the heel. I emailed the company and said WTF. (in a nice way of course) for $110 pair of shoes, you’d think they would last longer… He told me maybe it’s because the shoes were too big. Nope, not the case. He also told me that I’m taking my shoes off without untying them. Nope not the case. 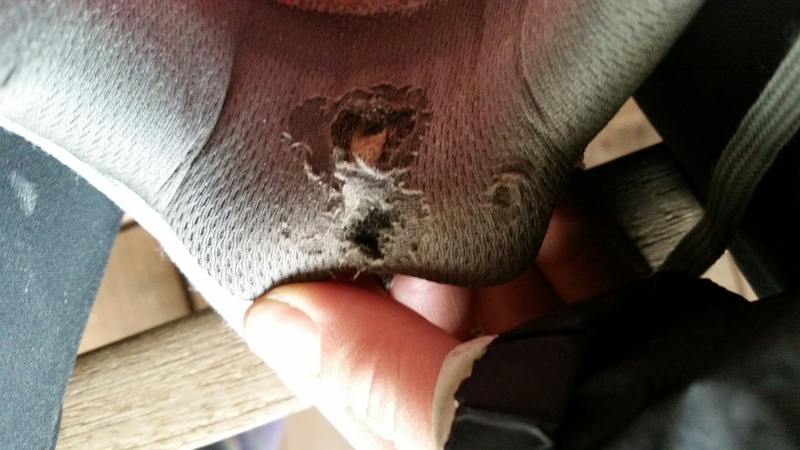 The holes actually are starting to create blisters as the fabric bunches up and rub wrong on my heel. I am hoping for good news from the rep to see what is happening. I get that you will go through shoes ona thru-hike, but within a 100 miles and that… I didn’t hike the swamp with them to keep them intact so technically is was like 70 miles. Oh well. Let’s hope for good news. Time for bed and looking forward to sleeping in tomorrow as it will be another zero day for me. Yay! I’m sad to hear of such an early death to the Altras! Not good! I hope you they were lemons and you get a new pair!